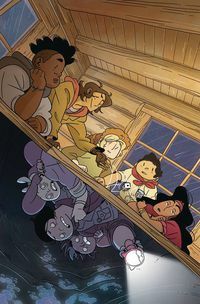 The Lumberjanes are lost and the gods are playing dire games! SuperQueeros: all that's lesbian, gay, bisexual, transgender, and queer in comics today! Will April, Mal, and Ripley make it back to the surface? Or will they spend the rest of their short lives six feet under? Plus, everyone else plays board games! The mothering invention continues, and things get goth-i-er. Deadpool takes on the Thieves Guild and gets hacked to bits by a pointy speedster! The new, dark gods are here! Can Wonder Woman triumph over this new evil? John's making choices, and Huntress is somehow representing the humane option!